Tale of conspiracy, deception and deadly shape shifting action. Prototype is a third person sandbox-style action adventure set in a virus-ridden New York City. As the protagonist, Alex Mercer, you wake up from a coma having lost your memory. You discover that you have been used as a host for a deadly genetic virus which has now spread to the streets of your home town. Alex discovers that he now has a devastating range of superpowers including brute strength, speed, and the ability to scale buildings. One of Alex’s most impressive abilities, however, is that he can shape-shift and take the form and skills of anyone he chooses. Furthermore, he can absorb people’s memories, which helps him immeasurably on his path to discover the truth about this deadly disease. Prototype features an open-world city where you can pick and choose whether to stick to the main missions or branch off and partake in dozens of side objectives to earn extra E.P. (Evolution Points,) which can then be spent on upgrading your skills and abilities. With a heavy emphasis on destruction - causing as much carnage as you can on the cluttered streets of New York City - Prototype warrants its ‘18’ rating by offering plenty of bloody violence, close-up melee action (slicing and dicing enemies apart) and over-the-top explosions. As Alex wages war looking for answers he encounters the Blackwatch, a mutated group that controlling the streets with heavy weaponry, tanks and helicopters. A large part of Alex's time is spent slaughtering members of the BlackWatch, crushing their tanks, plucking their helicopters right out of the sky and stealing their weapons to use for himself. Alongside his range of devastating melee and combat skills, Alex has perfected the art of parkour, allowing him to leap over cars, run up the side of buildings and barrel roll over park benches on his hunt for collectible orbs, or to take part in the numerous skill challenges that you’ll find across the city’s rooftops and busy streets. 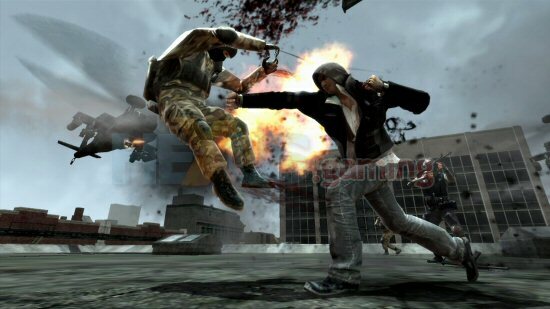 While Prototype's mission structure and type is typical of any sandbox game, you can expect plenty of explosive combat and an extremely deep upgrade and combat system. Alex lets you know right at the beginning that he’s a murderer and a terrorist. That's his excuse to allow you to cause utter carnage on your way to discovering the truth about the virus and Alex's mysterious powers.